Bulls are huge, powerfully built animals with menacing horns, devastating hooves, and an unflinching desire to be left alone. Bull-riders, by comparison, are sweaty little cowboys who feel it’s heroic to climb onto the backs of bulls, regardless of how irritating it is to the bull. Bulls have names like Destroyer, The Widow-Maker, and The Mauler. Bull-riders have names like Bucky, Earl, and that guy who used have testicles. Bulls are simple animals, content to stand around and chew their cud, occasionally pausing to pee on the dirt. Bull-riders are simple people, content to stand around and chew tobacco, occasionally pausing to pee on the dirt. The only thing in which bulls truly revel is inflicting life threatening injuries upon things that annoy them. The only things that bulls hate more than bull-riders are rodeo clowns, Kanye West’s fat head, and boy bands. 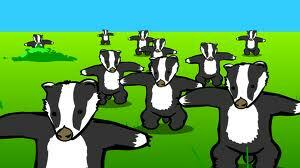 Note: it should be mentioned–the entire animal kingdom hates boy bands…especially badgers. We’re coming for you Timberlake. The bull is locked in a pen, which annoys it. The bull-rider then climbs onto the bull’s back, which really annoys it. The bull with the bull-rider on his back is released into an arena filled with jeering fans, which annoys it beyond belief because it hadn’t finished peeing. 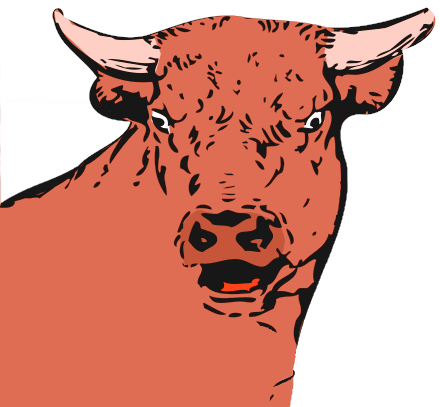 The bull storms around in a state of agitation that closely resembles a blind rage as it attempts to repel the annoyance that has so rudely interrupted his peeing. The bull swiftly dislodges the annoyance, launching him through the air. The annoyance crashes to the ground, tumbles several feet and skids to a halt. He displaces an impressive amount of manure filled dirt with his face. His teeth continue on for several more feet. As the bull-rider staggers to his feet, dazed and unsure of what’s happening, the bull finishes peeing then turns to face him. The bull lowers its horns and beats its hooves at the dirt; a malevolent glint appears in its dark animal eyes. As in any time of great crisis, men wearing make-up are called upon to save the day: the rodeo clowns are deployed. They dance around the bull, taunting and mocking it (evidently the bull is not pissed-off enough yet) until they can lure the bull’s attention away from the bull-rider. Sensing that their efforts are falling short, they form a line and belt out an N’sync medley. The bull becomes so confused with rage that it charges into the stands and heads straight for Kim Kardashian and Kayne West, who just happen to be in attendance. The bull gruesomely gores Kanye’s fat head–the crowd cheers wildly. 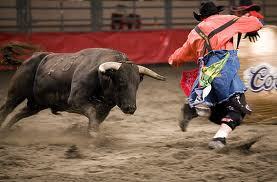 The bull-rider is saved; the rodeo clowns are showered with cheers and adulation. It seems that all is well, until a pack of frenzied badgers pour into the arena and savagely attack the rodeo clowns. After several moments of shrill screams and wild chittering, the badgers flee as quickly as they appeared. The rodeo clowns lie in the dirt, bloody and defeated, their painted on smiles betraying them. Somewhere in the deep recesses of it’s mind, the bull feels a deep sense of satisfaction.